Both sides pull their troops back from the face-off in Doklam. 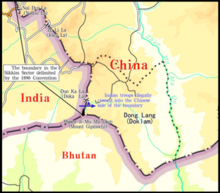 The 2017 China India border standoff or Doklam standoff refers to the military border standoff between the Indian Armed Forces and the People's Liberation Army of China over Chinese construction of a road in Doklam near a trijunction border area, known as Donglang, or Donglang Caochang (meaning Donglang pasture or grazing field), in Chinese. On 16 June 2017 Chinese troops with construction vehicles and road-building equipment began extending an existing road southward in Doklam, a territory which is claimed by both China as well as India's ally Bhutan. On 18 June 2017, About 270 Indian troops armed with weapons and two bulldozers crossed the Sikkim border into Doklam to stop the Chinese troops from constructing the road. On 28 August, both India and China announced that they had withdrawn all their troops from the face-off site in Doklam. Doklam is an area disputed between China and Bhutan located near their tri-junction with India. Unlike China and Bhutan, India does not claim Doklam but supports Bhutan's claim. The boundary of Sikkim and Tibet shall be the crest of the mountain range separating the waters flowing into the Sikkim Teesta and its affluents from the waters flowing into the Tibetan Mochu and northwards into other Rivers of Tibet. The line commences at Mount Gipmochi on the Bhutan frontier, and follows the above-mentioned water-parting to the point where it meets Nipal territory. China asserts that by this Convention, the starting point of the Sikkim-Tibet border is "Mount Gipmochi on the Bhutan frontier" and that this clearly defines the tri-junction point. As per Chinese claims, Doklam is located in the Xigaze area of Tibet, bordering the state of Sikkim. However Bhutan was not a party to the Convention. In keeping with the abiding ties of close friendship and cooperation between Bhutan and India, the Government of the Kingdom of Bhutan and the Government of the Republic of India shall cooperate closely with each other on issues relating to their national interests. From 1958, Chinese maps started showing large parts of Bhutanese territory as part of China. Localized tensions arose in the 1960s but in the 1970s negotiations between China and Bhutan, with India sometimes playing a supporting role, failed to create a consensus on the status of the Doklam plateau. Bhutan and China have held 24 rounds of boundary talks since they began in 1984, with notable agreements reached in 1988 and 1998, the latter also prohibiting the use of force and encouraging both parties to strictly adhere to peaceful means. In the early 2000s, China built a road up the Sinchela pass (in undisputed territory) and then over the plateau (in disputed territory), leading up to the Doka La pass, until reaching within 68 metres distance to the Indian border post on the Sikkim border. Here, they constructed a turn-around facilitating vehicles to turn back. This road has been in existence at least since 2005. It is the southward extension of this road that sparked the 2017 standoff. On June 16, 2017, Chinese troops with construction vehicles and road-building equipment began extending an existing road southward on the Doklam plateau. On 18 June 2017, around 270 Indian troops, with weapons and two bulldozers, entered Doklam to stop the Chinese troops from constructing the road. On 29 June 2017, Bhutan protested to China against the construction of a road in the disputed territory. According to the Bhutanese government, China attempted to extend a road that previously terminated at Doka La towards the Bhutan Army camp at Zornpelri near the Jampheri Ridge 2 km to the south; that ridge, viewed as the border by China but as wholly within Bhutan by both Bhutan and India, extends eastward approaching India's highly-strategic Siliguri Corridor. The Bhutanese border was reportedly put on high alert and border security was tightened as a result of the growing tensions. On the same day, China Foreign Ministry released a map depicting Doklam as part of China. Using the map as illustration, China's Spokesperson Lu Kang read Article I of the 1890 Convention of Calcutta and asserted that it proved that the Donglang (Doklam) area, a territory North East of Gipmochi as shown on the map, belongs to China. On 30 June, Ministry of External Affairs of India released the statement entitled Recent Developments in Doklam Area stating its official position. It charges China of changing status quo in violation of a 2012 understanding between the two governments regarding finalizing the tri-junction boundary points and causing security concerns, widely understood as at its strategic Siliguri Corridor. It says that "Indian personnel" at Doka La coordinated with Bhutan and "approached the Chinese construction party and urged them to desist from changing the status quo." Before the 1960s, if border inhabitants of Bhutan wanted to herd in Doklam, they needed the consent of the Chinese side and had to pay the grass tax to China. Nowadays the Xi Zang Tibet Archives still retain some receipts of the grass tax. On September 26 of the same year, when writing back to Premier Zhou Enlai, Prime Minister Nehru unequivocally stated "the boundary between Sikkim and Xi Zang, China was defined by the 1890 Convention. This boundary was demarcated in 1895. There is no dispute over the boundary between Sikkim and Xi Zang (Tibet), China". The so-called tri-junction, as the name suggests, is a point. It is not a line, much less an area. India misinterprets tri-junction point as an area, from ulterior motives. This time, the trespassing point of Indian army, is on the Sikkim-China border, which is 2000 metres away from the tri-junction point, Mount Gipmochi, by the 1890 Treaty. On 5 July 2017, the Chinese government said that it had for the past 24 months a basic consensus with Bhutan that Doklam belongs to China, and there was no dispute between the two countries. On 19 July 2017, China renewed its call for India to withdraw its troops from Doklam. On 24 July 2017, Chinese Foreign Minister Wang Yi told reporters that it is very clear who is right and who is wrong in the standoff in Doklam, and that even senior Indian officials have publicly said that Chinese troops have not intruded into Indian territory. "In other words, India admitted that it has entered Chinese territory. The solution to this issue is simple, which is that they behave themselves and withdraw," Wang said. On 2 August 2017, the Chinese foreign ministry released a 15-page official position statement The Facts and China's Position Concerning the Indian Border Troops' Crossing of the China-India Boundary in the Sikkim Sector into the Chinese Territory. According to this document, there were still over 40 Indian troops and one bulldozer in Doklam (Donglang) region. Beijing accused India of using Bhutan as "a pretext" to interfere and impede the boundary talks between China and Bhutan. The report referred to India's "trespassing" into Doklam as a violation of the territorial sovereignty of China as well as a challenge to the sovereignty and independence of Bhutan. China says in the 15-page document that it notified India regarding its plan to construct road "in advance in full reflection of China's goodwill". On 3 August 2017, China charged with four reasons that "India is certainly not for peace" though it always puts peace on its lips. On 4 August 2017, The Ministry of External Affairs of India refused to confirm or deny when asked why, if India received notification from China in advance on its plan to construct road, it had not used diplomatic channels before sending its troops across the border since it was asking for diplomatic solution. On 8 August 2017, Chinese diplomat Wang Wenli claimed that Bhutan had conveyed to China through diplomatic channels that the area of the standoff is not its territory, saying, "After the incident, the Bhutanese made it very clear to us that the place where the trespassing happened is not Bhutan's territory." On the next day, the Bhutanese government denied this, saying over the phone "Our position on the border issue of Doklam is very clear" and referring to the governments 29 June statement. On 15 August 2017, several Indian and Chinese soldiers were alleged to have been injured after a melee broke out between them when a group of Chinese soldiers were alleged to have attempted to infiltrate across the border near Pangong Lake into Indian controlled territory in Ladakh. An Indian intelligence officer said the confrontation occurred after Indian soldiers intercepted a Chinese patrol that veered into Indian-held territory after losing its way apparently due to bad weather. On 16 August 2017, the state run news agency released a segment of its show "The Spark" on Twitter racially attacking India, the video named the "Seven Sins of India" portrayed a stereotypical Indian with a turban and beard and a typical Indian accent, the segment spoke of Indians having "thick skin" and "pretending to sleep" on the matter of the border standoff between the two countries. The video went on to claim India was physically threatening Bhutan, and compared India to a "robber who breaks into a house and does not leave". The content of the video were factually incorrect. The video has received strong backlash on Twitter as well as from the international media. On 9 October 2017 China announced that it is ready to maintain peace at frontiers with India reacting to Indian Defence Minister Nirmala Sitharaman's visit to Nathu La. After issuing a press statement on 29 June, the Bhutanese government and media maintained a studious silence. The Bhutanese clarified that the territory on which China was building a road was "Bhutanese territory" that was being claimed by China, and it is part of the ongoing border negotiations. It also defended the policy of silence followed by the Bhutanese government, saying "Bhutan does not want India and China to go to war, and it is avoiding doing anything that can heat up an already heated situation." However, ENODO Global, having done a study of social media interactions in Bhutan, recommended that the government should "proactively engage" with citizens and avoid a disconnect between leaders and populations. ENODO found considerable anxiety among the populace regarding the risk of war between India and China, and the possibility of annexation by China similar to that of Tibet in 1951. It found a strengthening of Bhutanese resolve, identity and nationalism, not wanting to be "pushovers". The New York Times said that it encountered more people concerned about India's actions than China's. It found expressions of sovereignty and concern that an escalation of the border conflict would hurt trade and diplomatic relations with China. ENODO did not corroborate these observations. Rather it said that hundreds of Twitter hashtags were created to rally support for India over China and that there was a significant blowback over the Xinhua video "7 sins". Scholar Rudra Chaudhuri, having toured the country, noted that Doklam is not as important an issue for the Bhutanese as it might have been ten years ago. Rather the Bhutanese view a border settlement with China as the top priority for the country. While he noticed terms such as "pro-Chinese" and "anti-Indian" often used, he says that what they mean is not well-understood. On 28 August 2017, India and China announced that they had agreed to pull their troops back from the face-off in Doklam. By the end of the day, it was reported that the withdrawal was completed. The Indian troops withdrew back to their original positions at their outpost at Doka La, located in a militarily advantageous position on the Bhutanese border, less than 500 meters away down the ridge slope. The Times of India, citing a source, reported: "Our soldiers sit on the top, hold the ridge and can swiftly intervene, as they pro-actively did in mid-June, if the People's Liberation Army once again tries to unilaterally change the status quo by constructing a road near the Sikkim-Bhutan-Tibet tri-junction." Ministry of External Affairs (MEA) of India released a press statement stating that India and China had mutually agreed to disengage. It said that India and China had maintained diplomatic communication in recent weeks and that India was able to convey its "concerns and interests". In Beijing, the foreign ministry spokeswoman said that the Chinese forces on site have verified that the Indian troops pulled out, and implied that Chinese troop numbers would be reduced. She said that the Chinese troops would continue to patrol the area, to garrison it and to exercise "sovereign rights". However, she made no mention of road-building activities. The statement from the Chinese Foreign Ministry spokesman, as The Diplomat reported, "offered Beijing a face-saving way out of the impasse." Indian MEA issued a second statement later in the day that both the sides have withdrawn "under verification". The Indian news channel NDTV reported that, by the end of the day, Chinese road-building equipment was removed from the face-off site. Some experts warned that one shouldn't be overly optimistic as another standoff is entirely possible. The Washington Post commented that it was not clear if China had offered any concessions in return for the Indian withdrawal, such as agreeing to halt road construction. It said that the deal allowed both sides to save face. However China was continuing to be "cagey" in its official remarks. Al Jazeera said that China was not giving up its historical claims and it expected India to respect its "historical borders". Scholar Taylor Fravel pointed out that there are plenty of options available to China to garrison the area other than extending the road. On 29 August, Bhutan welcomed the disengagement and hoped that it would lead to the maintenance of peace and tranquility as well as status quo along the borders. On 5 September, Prime Minister Narendra Modi and President Xi Jinping held hour-long discussions on the sidelines of the BRICS summit. They agreed on a "forward-looking" approach and vowed to make efforts to ensure that situations like the Doklam standoff do not recur. They reaffirmed that maintaining peace and traniquillity in the border areas was essential for the relations between the two countries. On 7 September, some media reports claimed that both nation's troops still were patrolling the area at the face-off site, simply having moved 150 meters back from their previous position. ^ a b c "India, China soldiers involved in border altercation: Indian sources". Reuters. 18 August 2017. ^ a b "Press Release – Ministry of Foreign Affairs". mfa.gov.bt. Archived from the original on 30 June 2017. Retrieved 20 August 2017. ^ a b c d Barry, Steven Lee Myers, Ellen; Fisher, Max (26 July 2017). "How India and China Have Come to the Brink Over a Remote Mountain Pass". The New York Times. ISSN 0362-4331. Retrieved 16 August 2017. ^ a b "China says India violates 1890 agreement in border stand-off". Reuters. 3 July 2017. Retrieved 16 August 2017. ^ a b Safi, Michael (5 July 2017). "Chinese and Indian troops face off in Bhutan border dispute". The Guardian. Retrieved 10 August 2017. ^ China Foreign Ministry 2017, p. 1. ^ a b "China warns Indian troops to get out of contested region". Retrieved 10 August 2017. ^ "Doklam Standoff: Beyond Border Dispute – Mainstream Weekly". mainstreamweekly.net. Retrieved 10 August 2017. ^ Mitra, Devirupa (5 July 2017). "Expert Gyan: On India, China Stand-Off At Border Tri-Junction With Bhutan". The Wire. Retrieved 11 August 2017. ^ Barry, Steven Lee Myers, Ellen; Fisher, Max (26 July 2017). "How India and China Have Come to the Brink Over a Remote Mountain Pass". The New York Times. Retrieved 11 August 2017. ^ "Sikkim standoff: Beijing should realise Bhutan is as important to India as North Korea is to China". Firstpost. 30 June 2017. Retrieved 11 August 2017. ^ Staff (28 June 2017). "Indian bunker in Sikkim removed by China: Sources". The Times of India. Archived from the original on 6 July 2017. Retrieved 28 July 2017. ^ China Foreign Ministry 2017, p. 12–13. ^ a b China Foreign Ministry 2017, p. 5. ^ "关系：洞郎地区 (3964647)S". OpenStreetMap. Retrieved 7 August 2017. ^ https://mea.gov.in/ (2 March 2007). "INDIA-BHUTAN FRIENDSHIP TREATY" (PDF). Retrieved 13 August 2017. ^ Sandeep Bharadwaj, Doklam may bring Bhutan closer to India, livemint, 9 August 2017. ^ Ankit Panda, The Political Geography of the India-China Crisis at Doklam, The Diplomat, 13 July 2017. ^ Barry, Steven Lee Myers, Ellen; Fisher, Max (26 July 2017). "How India and China Have Come to the Brink Over a Remote Mountain Pass". The New York Times. ISSN 0362-4331. Retrieved 24 August 2017. ^ "Press Release – Ministry of Foreign Affairs". 21 August 2017. Archived from the original on 21 August 2017. Retrieved 24 August 2017. ^ Shaurya Karanbir Gurung Behind China's Sikkim aggression, a plan to isolate Northeast from rest of India Archived 24 August 2017 at the Wayback Machine, The Economic Times, 3 July 2017. ^ "Bhutan issues scathing statement against China, claims Beijing violated border agreements of 1988, 1998". Firstpost. 30 June 2017. Retrieved 30 June 2017. ^ "EXCLUSIVE: China releases new map showing territorial claims at stand-off site". Retrieved 6 July 2017. ^ a b "Recent Developments in Doklam Area". mea.gov.in. Retrieved 16 August 2017. ^ Diplomat, Ankit Panda, The. "What's Driving the India-China Standoff at Doklam?". The Diplomat. Retrieved 17 August 2017. ^ "Foreign Ministry Spokesperson Lu Kang's Regular Press Conference on June 30, 2017". Archived from the original on 1 February 2018. Retrieved 25 August 2017. ^ a b "Foreign Ministry Spokesperson Geng Shuang's Regular Press Conference on July 3, 2017". fmprc.gov.cn. Retrieved 16 August 2017. ^ Full letter EXT-1959-10-04_8160, Government of India. Retrieved 25 August 1947. ^ PTI (5 July 2017). "No dispute with Bhutan in Doklam: China". Retrieved 6 July 2017 – via The Economic Times. ^ "China holds live-fire drills in disputed Himalayan territory, tells India to withdraw". 19 July 2017. Retrieved 19 July 2017. ^ a b China Foreign Ministry (2 August 2017). "The Facts and China's Position Concerning the Indian Border Troops' Crossing of the China-India Boundary in the Sikkim Sector into the Chinese Territory (2017-08-02)" (PDF). Archived from the original (PDF) on 2 August 2017. Retrieved 15 August 2017. ^ "Foreign Ministry Spokesperson Geng Shuang's Remarks on the Indian Border Troops' Illegal Crossing of the China-India Boundary into the Chinese Territory". fmprc.gov.cn. Retrieved 25 August 2017. ^ "China says India building up troops amid border stand off". Reuters. 4 August 2017. Retrieved 16 August 2017. ^ Joseph, K.J.M Varma and Anil K. "Bhutan Acknowledges Doklam is Under Chinese Territory, Claims Top Chinese Official". thewire.in. Retrieved 25 August 2017. ^ "Bhutan rejects Beijing's claim that Doklam belongs to China". The Times of India. Retrieved 25 August 2017. ^ "Bhutan Denies Ceded Claim Over Doklam". Sputnik. 11 August 2017. Retrieved 13 August 2017. ^ "China, India soldiers hurl stones at each other in Kashmir". ABC News. 16 August 2017. Archived from the original on |archive-url= requires |archive-date= (help). ^ Nyshka Chandran (17 August 2017). "Chinese media Xinhua mocks Indians and PM Narendra Modi's policies in racist video". CNBC. Retrieved 29 August 2017. ^ "Ready to maintain peace at frontiers with India: China on Sitharaman's visit to Nathu La". hindustantimes.com/. 9 October 2017. Retrieved 9 October 2017. ^ a b Steven Lee Myers (15 August 2017). "Squeezed by an India-China Standoff, Bhutan Holds Its Breath". The New York Times. ^ Tenzing Lamsang, Understanding the Doklam border issue, The Bhutanese, 1 July 2017. ^ Tenzing Lamsang, The Third Leg of Doklam, The Bhutanese, 5 August 2017. ^ Akhilesh Pillalamarri & Aswin Subanthore, What Do the Bhutanese People Think About Doklam?, The Diplomat, 14 August 2017. ^ a b Conflict Resolution: A Population-Centric Approach to Manage Regional Instability – Real-Time Social Media Analysis of the Standoff in Bhutan, ENODO GLobal, August 2017. ^ Rudra Chaudhuri, Looking for Godot, The Indian Express, 3 September 2017. ^ a b China and India Agree to Ease Tensions in Border Dispute, The New York Times, 28 August 2017. ^ a b Pandit, Rajat (29 August 2017). "Indian soldiers withdraw but hold vantage point, ready to step in again". The Times of India. Retrieved 3 September 2017. ^ a b "What China Learned About India at Doklam". The Diplomat. 31 August 2017. Retrieved 3 September 2017. ^ India and China agree on Doklam troop 'disengagement', Al Jazeera, 28 August 2017. ^ Taylor Fravel, Why India Did Not ‘Win’ the Standoff with China, War on the Rocks, 1 September 2017. ^ Bhutan welcomes end of Doklam standoff, The Times of India, 29 August 2017. ^ Doklam discussed, Pakistan skipped: Here's what happened at the 1 hour meet between Xi and Modi, The Economic Times, 5 September 2017. ^ "troops steeped back 150 meters each". Press Statement on Doklam disengagement understanding, Ministry of External Affairs (India), 28 August 2017. In Response to Questions on the Doklam Disengagement Understanding, Ministry of External Affairs (India), 28 August 2017. "Foreign Ministry Spokesperson Hua Chunying's Regular Press Conference on August 28, 2017". China Foreign Ministry. Retrieved 31 August 2017. "Foreign Ministry Spokesperson Hua Chunying's Regular Press Conference on August 29, 2017". www.fmprc.gov.cn. Retrieved 31 August 2017. "Press Statement on Doklam Disengagement – Ministry of Foreign Affairs". www.mfa.gov.bt. Retrieved 31 August 2017. This page was last edited on 13 April 2019, at 23:36 (UTC).